After a long trip that included varied conditions and a chance at the course record, John Sangmeister’s Lending Club is the first boat in the fleet to cross the finish line in the 47th Transpac at Diamond Head tonight at 21:52:33 local time, for an elapsed time of 5 days 11 hours 52 minutes 33 seconds over the 2225-mile course. The modified ORMA 73 trimaran was sailed by a crew of nine and was just a few hours of breaking the fully-crewed multihull course record of 5 days 9 hours 18 minutes 26 seconds set in 1997 by the 86-foot catamaran Explorer. 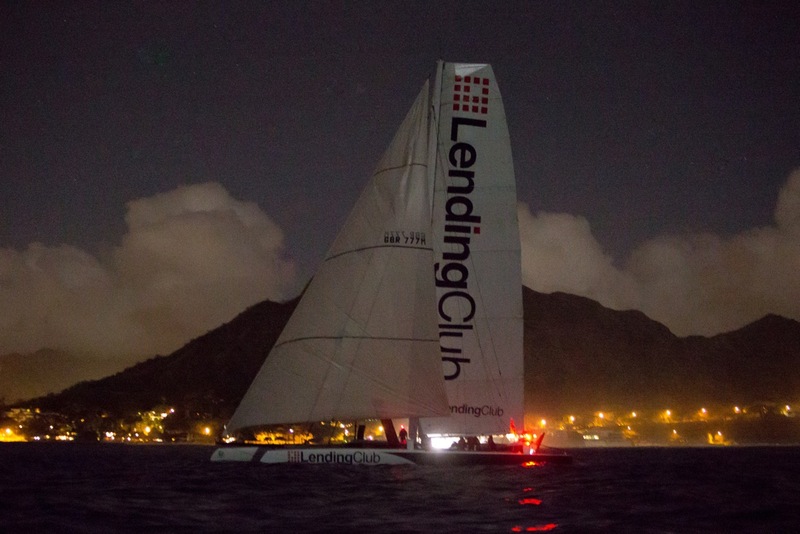 The boat sustained damage from two separate impact incidents that damaged the carbon fibre centerboard. “There were at least six major impacts we had with debris out there. In all, I think we probably spent about 10 hours working with the damage onboard,” said boat captain Ryan Breymaier. Breymaier explained that the team had to hoist the board up out of the hull, assess the damage, then re-insert it because the water pressure at high boat speeds could create damage to the trunk. The board was even swapped end-for-end after one large impact, but then that end was damaged too. “Despite all these problems, it was still a great race,” Braymaier said, who has been an active offshore multihull racer for several years, most recently in the MOD 70 Class. The next boat on the horizon to the east will be the first monohull to finish, Bob Hayward’s Seastream 650 Manatea in Division 8 who started on Monday, July 8th. 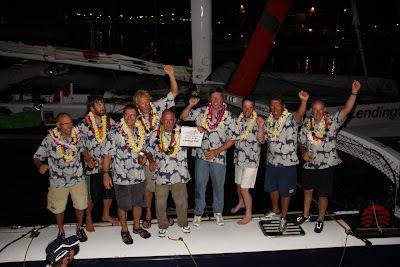 They are expected to cross the Diamond Head finish line at just after dawn local time on Friday, July 19th.